Anamaya runs weekly Yoga Retreats and month long Yoga Teacher Trainings, and has captured the attention of retreat leaders from around the world. The unique, top notch location next to a spectacular waterfall, 270 degree ocean views, beautiful infinity pool, and inspiring energy of Anamaya’s team have made nearly everyone who has visited convinced that they should book their next retreat with us. We are currently working with many talented people to bring yoga, aerial silk dance, surfing, circus skills, specialized workshops, meditation, art, and more to Anamaya. These yoga packages are added to your base rate. The luxurious accommodations, healthy organic food, and sense of exotic style create an intimate and unforgettable experience that you will rave to your friends about. Our most basic package, generally for people who want to experience Anamaya but aren’t planning to do yoga every day, or at all. Lodging and food are included, but yoga, surfing, and other activities are a-la-carte. Our most inexpensive option. If you imagine yourself spending a lot of time just lounging in the pool, resting in a hammock, or exploring other activities we have to offer, then this option is for you. Surfing and Yoga in one amazing package! We’ll take you to the best surf spots in the Montezuma, Malpais, and Santa Teresa area, where our expert instructors will get you up and riding waves in no time. Daily yoga and other activities are included as well. Offered during all our weekly retreats. Can you imagine yourself doing yoga and relaxing in tropical paradise? 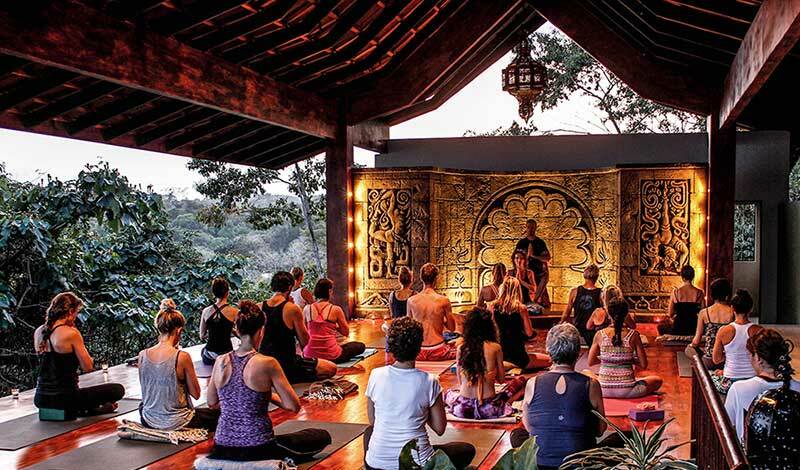 With this yoga retreat, you will enjoy all the best that Costa Rica and Anamaya have to offer: daily yoga, jungle adventure, and plenty of time to relax on some of the world’s most beautiful beaches. Come see why Costa Rica was found to be the happiest country on the planet! Offered any week you see “Yoga & Adventure” on the calendar below. This is similar to the Yoga and Adventure retreat above, but this one is designed for those want to rest and recharge. It includes 10 yoga classes, a beach sunset excursion, two 60 minute massage treatments, cooking class, dance class, a circus performance, and lots of time to lounge by the pool or swing in a hammock. Treat yourself to some well deserved time away. Our most inexpensive option at Anamaya, it doesn’t include the excursions or any extras. It includes 10 yoga classes throughout the week and a circus performance. But don’t worry, you can always add on excursions, spa treatments, workshops or classes when you arrive if you desire. Are you looking for a vacation that will re-charge your love and commitment to each other? Anamaya’s couples retreat is ideal, since it’s a place to re-fall in love. You’ll share a private cabin together, and it will include a couples massage, and private dinner. Enjoy our other amenities and make new friends too, but this week will be the special time together that all couples need once in a while. Our Permaculture and Yoga retreat is held at our farm, Rancho Delicioso, NOT at Anamaya! If it’s luxury you want, Anamaya is for you, because at the farm you’ll be roughing it, living in a small dorm/farmhouse and getting your hands dirty in the soil. If you’re looking to learn about organic farming and sustainable living, this is for you. It makes a great “add on” to a week at Anamaya. If you’re already paying for a flight down here, why not stay an extra week at our farm? It includes 6 nights accommodation, 3 organic meals a day, all yoga classes, and daily permaculture classes too. At least one of the yoga classes will be held at Anamaya, but most will be at the farm. Red background: Indicates a retreat that’s FULL, but we can put you on the waiting list. The prices shown here don’t include meals and accommodations, which are found on our rates page. Please read our Retreats FAQ page, which is extensive and carefully crafted to answer almost all the questions that our guests routinely have. You will find it very helpful.